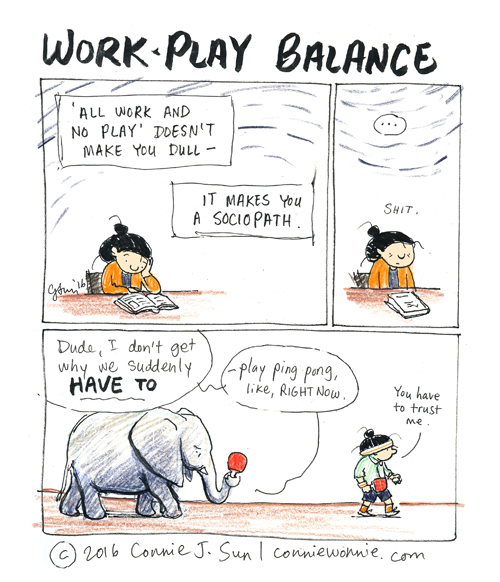 'All work and no play' doesn't make you dull, it makes you a sociopath. Thanks, now I want to play ping-pong with an elephant. Well done, Connie. Not often that you (or anyone, for that matter) achieve irony, absurdity and self-deprecation in a well-balanced mix! And thanks to Andrew Crow above for fine comment in the spirit of the post. Beg to differ, Cilliers. Connie achieves a fine balance of irony, absurdity and self deprecation in nearly every vignette. That is what makes her comic excellent. Two of the three, almost always, certainly, Anna. But good absurdity is a rare thing by itself, never mind to be found in such an exceptional blend. I would however also agree that the lady sets her own standard!